The movie ‘Detective Byomkesh Bakshy!’ is a stylized, quirky take on India’s most famous fictional sleuth. Although the movie is based on the works of Sharadindu Bandyopadhyay and incorporates a number of elements from the books, the movie is also original in its own way and contains significant departures from Sharadindu’s works. Here we take a look at a number of themes, references and homages touched upon in the movie. Byomkesh abhors the word ‘detective’. This is known to anyone who has even a cursory knowledge of the character. Thus, by putting the word ‘detective’ in front of the name of Byomkesh, Dibakar Banerjee, the director, pronounces loud and clear his intention of making his Byomkesh significantly different from the Byomkesh of Sharadindu. Interestingly though, Sharadindu writes in one of his stories that although Byomkesh hates the word ‘detective’ and calls himself a ‘Satyanweshi’, he knows deep inside that he is nothing but a private detective. Almost echoing this sentiment, when in one of the scenes of the movie, the deputy commissioner of police asks Byomkesh, ”So, you are a private detective?”, he looks like he would protest for a second, bites his lips and says “Yes, Sir”. A wonderfully shot opening credit sequence shows Sushant Singh Rajput travelling through one of the busy, congested thoroughfares of Calcutta in a tram from Esplanade. It is apparent from the background images that the road passes right through the middle of a trading hub, most likely Burra bazar. Thus, in all probability, the road is Chitpur Road which passes right through Burra bazar and even today has a tram service. The terrace of Mahamaya lodge in the movie offers a great view of the Howrah bridge, which is plausible from the Tiretta Bazar. The Chinese locality is at a distance of less than 2 kilometers from the Howrah station and even today, the area does not have any high rises, thus offering unfettered view of one of Calcutta’s original landmarks. In the climactic scene, Byomkesh claims that Dr. Guha had set up his den (i.e. Mahamaya Lodge) only six kilometers from where Angoori Devi was staying. While the movie does not explicitly mention the address of Angoori Devi, one may reasonably assume she lives close to the mansion of her paramour, Mr. Gajanand Sikdar, whose address is shown to be 14, Elgin Road, in the movie. The distance between Elgin Road and Tiretta Bazaar is close to 6 kilometers. The lodge is loosely based on a similar ‘mess’ (as these lodges are called in Calcutta) which Byomkesh inhabits in the story ‘Satyanweshi’ by Sharadindu, the introductory story of the Byomkesh series. In the books, the author describes the area as a shady region located in the heart of Calcutta in the middle of a Marwari area, a Chinese locality and a slum – a description which also perfectly fits our area. Dibakar Banerjee has a slightly different idea about the address of the lodge. In one of the interviews related to the movie, he discusses finding the actual location of the lodge Sharadindu was staying in for three years between 1917 and 1920 i.e. 66, Harrison Street (now 66, Mahatma Gandhi Road). The book also mentions that Byomkesh along with Ajit and Satyabati was staying in a lodge in Harrison Road before moving to Keyatala Lane in South Calcutta in the sixties. Dibakar thus assumes that the lodge being inhabited by Byomkesh was the one of 66, Harrison Street and models the Mahamaya Lodge on the same. I would slightly differ from the interpretation of Banerjee here. Sharadindu might have placed Byomkesh in his own lodge in Harrison Street; however, the lodge where Byomkesh temporarily takes shelter in ‘Satyanweshi’ is different from the one where he moves into in Harrison Street at the end of the story. Further, although 66, Harrison Street is around a kilometer away from Tiretta Bazar lane, it cannot be called next door to the Chinese locality. In the movie as well, the lodge is shown to be located in one of the serpentine by-lanes of Calcutta and away from the tram line, whereas 66, Harrison Street stands right on a tram route. Both Ajit and Byomkesh in the movie are recent graduates of the Vidyasadan College, Calcutta. While the Vidyasadan College itself is fictitious, the director is probably referring to Vidyasagar College which served as the alma mater of Sharadindu Bandyopadhyay, the creator of Byomkesh, as well as a number of architects of the Bengal renaissance. While the story of the movie is based on the period between November, 1942 and February, 1943, none of the Byomkesh stories explicitly refers to this period. In fact, Sharadindu during this time was not even settled in Calcutta, as he was trying to make a living as a screenplay writer in Bombay. The closest he comes to describing this period in his Byomkesh collection was in ‘Aadim Ripu’ (‘The Primal Enemy’), one of his more fascinating works where the story is set in a tense riot-torn Calcutta in the period between the October, 1946 and August, 1947. Byomkesh in the movie repeatedly describes himself as belonging to Munger. He also reveals losing his parents in childhood. Sharadindu in the novels has never disclosed the birthplace of Byomkesh, although he has mentioned that Byomkesh’s parents (father – a mathematics teacher and mother – a religious housewife) had died in his teenage. Munger seems a reference to the fact that Sharadindu himself was born in Munger. Apart from this, ‘Byomkesh o Barada’, one of the Byomkesh stories was based in Munger. Sharadindu, in fact, had spent a number of years in Bihar which enabled him to set many of his stories in Munger, Patna and other smaller towns of Bihar. In the opening credit sequence, Sushant Singh Rajput is seen sitting in a tram and the passenger sitting next to him is reading a news paper with bold headlines of ‘Murder in Bosepukur’. Later on, the case which is being handled by him is also dubbed ‘Murder in Bosepukur’ by the newspapers. This is kind of strange as the murder of Bhuvan Banerjee happens in an abandoned chemical factory by the Ganges while that of Gajanan Sikar takes place in an Elgin Road bungalow, both quite far from the actual Bosepukur locality of Calcutta. The name of Bosepukur probably appears as a reference to ‘Bosepukure Khunkharapi’ (‘Murder in Bosepukur’ in English), a story by Satyajit Ray involving Feluda, the other iconic fictional Bengali detective. 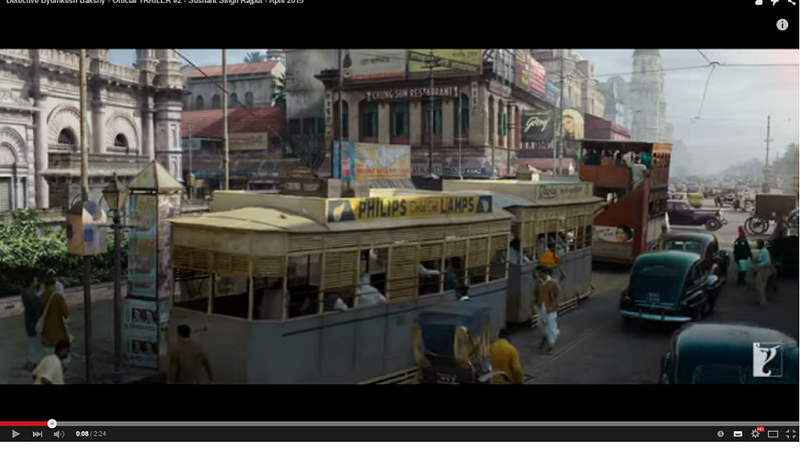 ‘Detective Byomkesh Bakshy!’ is very similar in look and feel and plot line to ‘The Blue Lotus’, a Tintin classic. The latter, written in 1934, was set in Shanghai, against the backdrop of Japanese invasion of Manchuria in 1931 and was about busting of opium smuggling carried out by a Japanese spy in collaboration with an international smuggling chain. The busting was done with the help of a Chinese gang known as ‘Sons of Dragon’ which was against opium trade. ‘Detective Byomkesh Bakshy!’, on the other hand, set in Calcutta, is set against the backdrop of Japanese invasion of India and is also about busting of an opium smuggling racket about to be set up by a nation less super villain in collaboration with the Japanese army. The busting in this case is also done with the help of ‘Green Gang’, a Chinese gang, although in this case it is an opium gang. The movie also repeatedly refers to the 1931 invasion of Manchuria and subsequent fall of Shanghai at the hand of the Japanese. Apart from similarities in the basic plot, the movie also unfolds very similar to a Tintin comics. Truths are uncovered less through deductions and more through being there at the right place and at the right time through accidents. One of the characters in the movie (Kanai Dao) sports a Tintin hair-do. And most of all, some of the sequences look like brilliant recreations of classical Herge’ slapstick chase scenes. For example, there is a scene where Byomkesh and Ajit are being followed by a person through the crowded footpaths of BBD Bagh. Both Byomkesh as well as his stalker collide in turn against a Bengali babu carrying a fish by a hook. And the whole scene is shot through the windows of a parked car. This looks very similar to any of the chase sequences involving Tintin, seen in countless Herge’ comics. The Hindi newspaper repeatedly shown in the movie is named ‘Dainik Dhumraketu’ with a diagram of a comet at the top of the front page. In the Byomkesh stories, he is known for reading ‘Dainik Kalketu’, a Bengali daily. Both Kalketu and Dhumraketu appear to be fictional publications with the former inspiring naming of the latter. Both are also very odd names for daily newspapers. Kalketu is, in fact, a Bengali mythological hero of medieval Chandimangalkabya literature. His father’s name, by the way, is Dharmaketu. ‘Pather Kanta’ is the first ever written Byomkesh story although the character later finds an introduction through ‘Satyanweshi’. The villain of the story i.e. Prafulla Ray finds a mention in the movie. Just like in the books, he introduces himself as an insurance agent. However, in a major disappointment, the character of Prafulla Ray hardly plays any part in the movie. Instead, a missing paan box which has a major role in the movie, also looks like a reference to the Prafulla Sen of the books, who is a habitual paan eater and is known to keep a paan box always by his side. In another scene, Byomkesh and Ajit try in vain to disguise themselves with fake wigs and make-ups, a reference to a similar such failed attempt in ‘Pather kanta’. ‘Satyanweshi’ is the story that serves as the formal introduction of the character of Byomkesh to readers. The movie plot here is based loosely on the plot of ‘Satyanweshi’ at least in the first half before diverging significantly in the second half. The atmosphere of the lodge where Byomkesh finds himself landing in is faithfully recreated in the movie, although with slightly different cast of characters. Some of the characters of ‘Satywaneshi’ including Dr. Anukul Guha and Ahwinibabu also make appearances in the movie, albeit in considerably different forms. ‘Arthamanartham’ is the story where Byomkesh gets to meet Satyabati. Dibakar Banerjee cleverly weaves in some of the plot elements of ‘Arthamanartham’ into the movie. Most of the scenes including Satyabati are adapted in some form from this story. The director pays underhanded compliment to the most well known fictional detective of all time by borrowing one element from ‘The Hound of Baskervilles’ i.e. composing letters by cutting out newspaper captions, which also proves to be a major element in the plot line of the movie. The ace detective also finds a mention when Byomkesh is compared by the local newspapers to Sherlock Holmes after appearing to crack the case. The director takes a lot of pain to bring the Calcutta of the 1940s alive on screen and succeeds brilliantly. The portrayal of Calcutta is definitely one of the highlights of the movie. 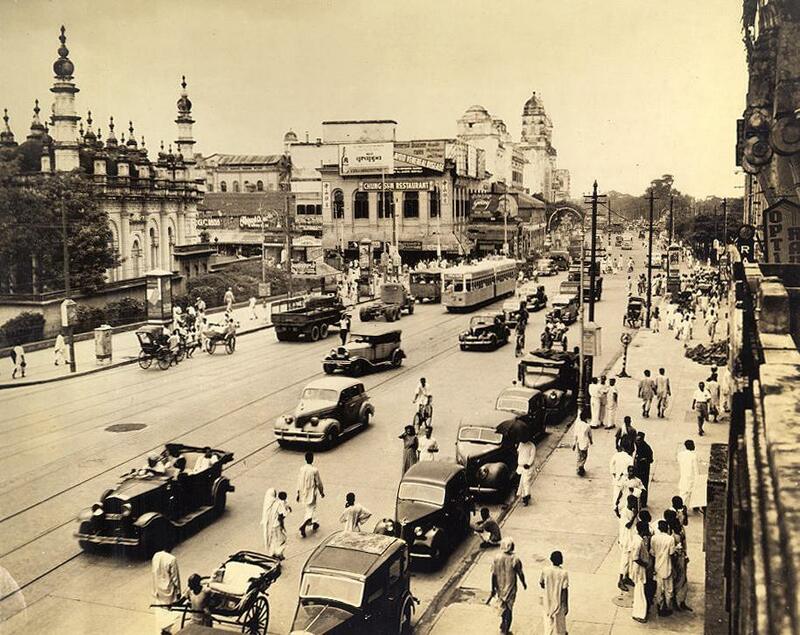 Take one look at the two pictures of Chowringhee below and you will appreciate how a lot of minute details of that era have been captured in the movie. The only complaint is that Calcutta, despite being a truly cosmopolitan city at that day and age is shown to be inhabited by only Bengalis, Chinese, English and the odd Biharis and Punjabis. Calcutta in the movie, being set in late 1942 and early 1943, escapes the steady stream of hungry, dying refugees from the countryside that was brought about by Great Bengal Famine of 1943. The movie, however, alludes to this as beggars start making appearances along the pavements gradually as the movie progresses. The character of Angoori Devi, with her ridiculous accent and laughable attempts at seduction, is one of the weakest links of the movie. Dibakar Banerjee in a number of interviews has made it clear that the character is based on Mata Hari, the famous and almost mythical exotic dancer who doubled up as a spy during World War I, and now serves as the platinum standard for all femme fatales. Byomkesh, married off early in his detective career and being a true Bengali bhadralok, had scant interest in any adulterous affairs; also, he never had to directly come across an Angoori Devi like character in the books (unlike say, Sherlock Holmes who had Irene Adler). However, in one of the stories ‘Magna Mainak’, one of the major characters of the story, an Indian Hindu politician, has an affair with a Mata Hari like Pakistani Muslim seductress at the height of the agitation over Pakistan and the ensuing communal riots. He discloses to her all the confidential strategies from the Indian side, thus paving the way for partition of India. Byomkesh is shown to be having aloo bhaja with tea at least thrice in the movie and it seems to be a favourite snack of his. This has invited scorn from a number of critics on the internet. While the idea of having aloo bhaja with tea does not sound very appealing, especially to a Bengali stomach prone to getting upset at the slightest hint of disruption, Sharadindu does refer to Byomkesh having his tea with ‘bhajabhuji’ (fried items, including brinjal, flaked rice, papad, etc.) in a number of stories. Also, Byomkesh is shown having aloo bhaja with tea at least once in his stories. So the idea may not be so outlandish. Dr.Anukul Guha is probably the only villain in the Byomkesh world who appears in two different stories. While Byomkesh of Sharadindu is known to empathize with and even respect a number of criminals, Dr. Anukul Guha is one character he has no sympathy for. And the feeling is mutual. In fact, Dr. Guha, after getting released from jail, comes back with a highly distorted appearance and a false name to take revenge on Byomkesh and managed to almost kill him with a deadly matchstick (this story will probably form the basis of the sequel to this movie). However, Dr. Guha of the movie is vastly different from the one from the books. Dr. Guha in the movie is portrayed a diabolical genius with almost superhuman prowess, a combination of Joker and Moriarty, a super villain capable of taking different appearances, with delusions of grandeur and an ability to fight himself out of any situation. Dr. Guha from the books is, however, a simple criminal hiding himself in a noble profession, a wolf in sheep’s clothing, an evil mind with scant regard for human life, essentially a psychopath who is not afraid to kill people to preserve his trade and one who neither forgets nor forgives. He is a cold blooded criminal who does not have the flair or the megalomania of Yang Guang. On a related note, the character of Yang Guang in the movie seems to be inspired, at least partly, by Subhash Chandra Bose. Consider this – a mythical living crusader, adept at taking disguises and faking his own death, who escapes the authorities across many countries, has a foreign born paramour and fights against the British in India during World War II through a secret scheme to let the Japanese invade India –this can be both the fictional Yang Guang or the real Subhash Chandra Bose. Some of the dialogues mouthed by Yang Guang in his noble freedom fighter avatar (including ones like ‘everyone wants freedom, but nobody wants to pay the price’) are eerily reminiscent of the clarion calls by Bose during the heydays of the Azad Hind Fauz (incidentally, the same period where the movie is set). And the climactic scene where Yang Guang is taken as dead by everyone, but actually manages to escape without leaving any living witnesses, could be taken as a fantastic explanation of the controversial death/disappearance of Subhash Chandra Bose.